I am very glad I decided to take some time putting together my Charming Chevrons Do-It-Yourself Quilt Tutorial, and spread it out over several weeks. 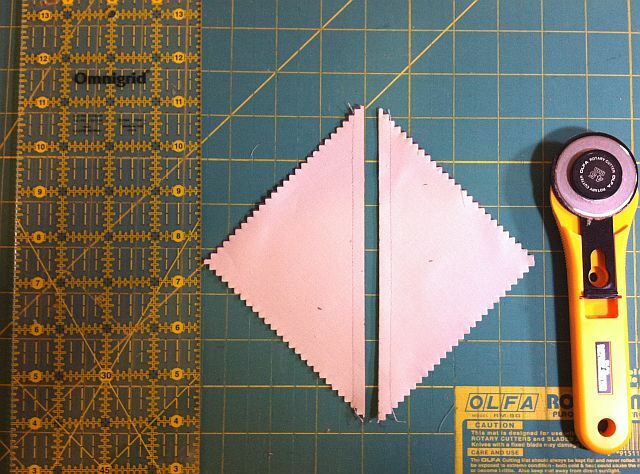 This week’s step of making the triangle squares is a very simple process; however it was a little time consuming. It took a total of 3 hours to complete the steps below. That’s not bad considering I’m giving you a whole week to complete it, but I suggest you break it up over a few cutting sessions. It’s too tedious to do all at once! Scroll down to the end for the complete schedule. 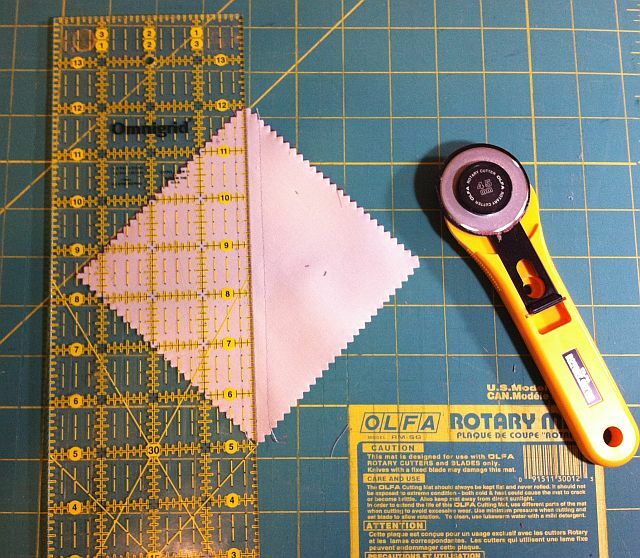 With your ruler, rotary cutter and mat, slice each pair of sewn squares in half on the diagonal, down the middle on your previously drawn line. You may use scissors instead, but rotary cutting them is definitely faster. Each pair of squares has been sewn together 1/4 inch away from the drawn line, yielding 2 half square triangles per each pair of charm squares (following last week’s instructions). I like to stack them up as I cut, keeping the same pairs of colors together. They look like little fabric sandwiches. Yummy! It took me longer then normal to press the squares because I starched each block first. I am not sure if I’m happy with the results so I mention this with caution – test on the back side or some scrap fabric first or just skip it. I got starch marks on the front sides of several of the blocks. I had to soak them in water to get the marks out. And yes, I used Mary Ellen’s Best Press which was not supposed to leave any residue. So I’m not sure if I had my iron on too high of a setting, or perhaps it doesn’t work well with solids? Is anyone else familiar with this? I’m still a starching newbie. 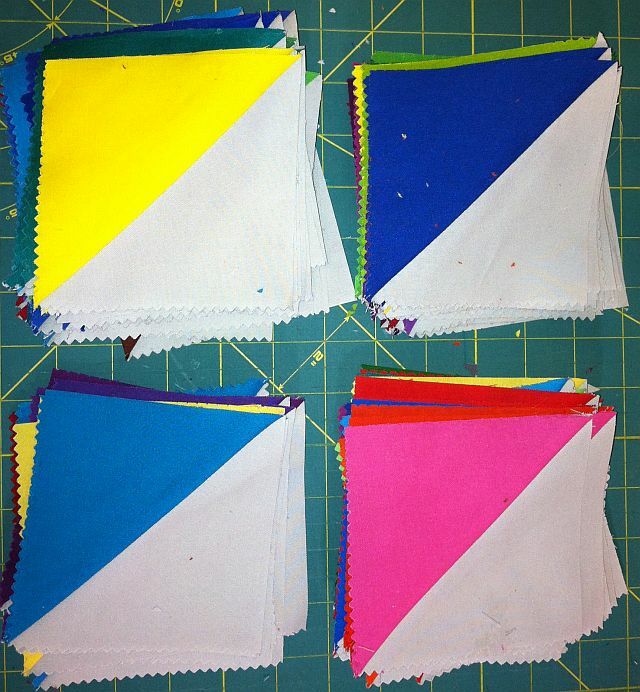 This is why I’m making this quilt in real time – so I can learn these things! So if you just press your squares without worrying about starch or sizing, it will be quicker! I pressed all of my seams toward the darker fabric. Once my stacks were all pressed, it was time to trim them to size! This was the tedious part because you will be trimming a total of 168 squares 1 at a time! So set aside a few afternoons and enjoy the process! 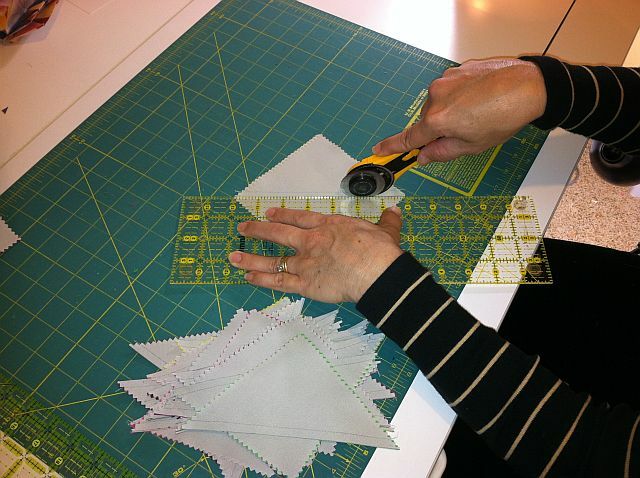 With a square ruler and a sharp cutter, trim the blocks so that they measure 4 1/2 inches. Line up the diagonal line of your ruler on the seam of the blocks. Then trim the sides. 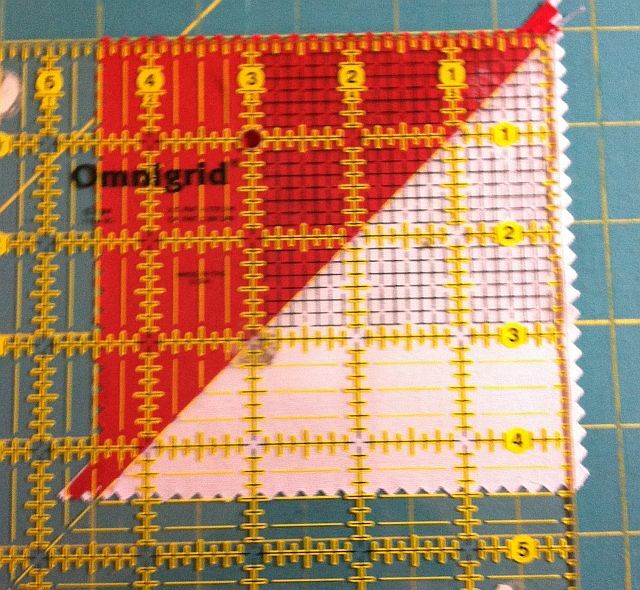 You may be able to trim only on 2 sides, or you may need to trim all four sides depending on where you need to slide your ruler so that the diagonal line stays in the center of the block. When you are all finished trimming, you will have a leftover pile of cuttings. I think it looks rather pretty, don’t you? You can use it as colorful stuffing or confetti. 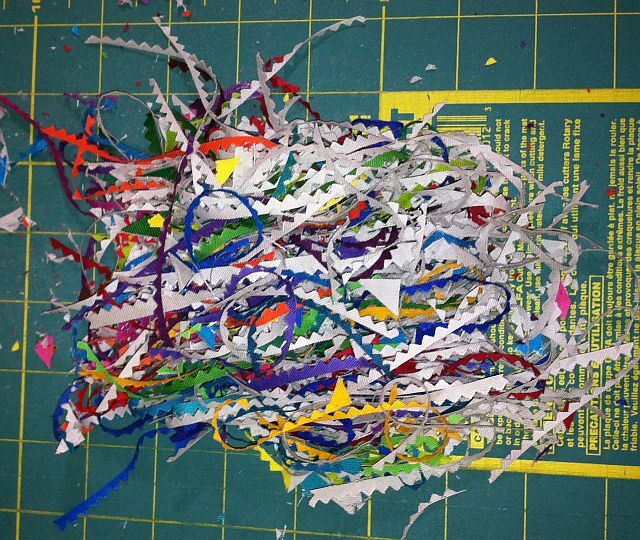 Or how about wrapping up used needles or rotary blades with these scraps, put them in a bag, and safely throw away these sharp objects! I save the tiny cuttings for the birds. They make nest from them. This is a really nice quilt, Christa 🙂 Thanks for posting this quiltalong! Re. 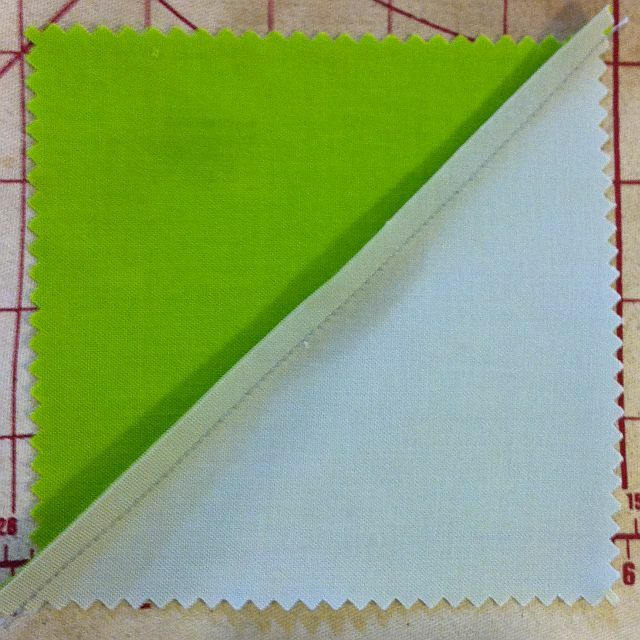 starching: Try running the hot (dry) iron over the fabrics prior to spraying starch. (Heat helps them to better absorb the starch). Spray them with starch. Allow them to sit for a few moments before ironing them. Thanks for the tips Jane! I am having so much fun working on these! I’ve just bought a new machine and it sure makes a difference in what I can sew and how quickly (threads not breaking, etc.). I decided to make my squares 8.5 inches instead of the 5 inch size. I used my Excel to design a new grid and layout. I think I have it figured out 🙂 but I’ll know for sure when I actually lay it down to make the chevrons. I’m figuring I can fix the sizing with borders, correct? Thanks Christa for all the work on this! At the beginning of this tutorial you said it would be okay to use a layer cake. 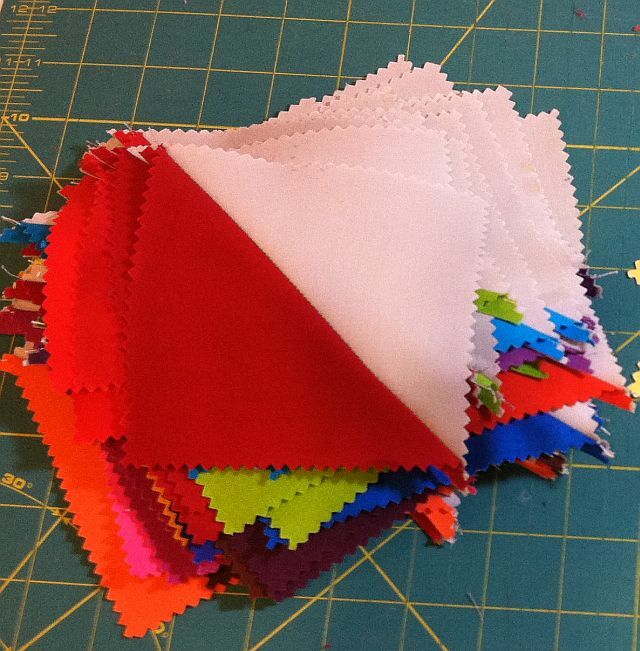 I have cut my layer cakes into quarters so I have twice as many HSTs to do. Very time consuming and tedious but I believe I will be happy with the larger size. Can you mention how many across an how many down I should get using all four quarters of the layer cake? I don’t have a design wall so I can’t lay them out all together. Yes! Please see my follow up post on that very question, posted to my blog last Thursday – it includes a picture showing the layout of your triangle squares. I will also include another followup this coming Thursday. You will need a total of 320 triangle squares, and layout will be 16 x 20. Another fun thing to do with all those tiny scraps…save until early spring and then sprinkle outside and watch the birds take it to use for nest building! That’s what I plan to do next spring. What a great idea Diane – I’ll include this tip in my follow-up post on Thursday.